Am I Brave Enough to Be Me? I am sitting on a cabin step in upstate New York with a woman from Vermont who I met less than 48 hours ago. We are both participants in the Camp Good Life Project (Camp GLP). It’s my third year at this summer camp for creative souls, entrepreneurs, and change-makers. It’s a weekend of wisdom, deep learning, creating, playing (color wars + dance parties), meditation, yoga classes, and an outrageous talent show. More than that, it’s a weekend of deep connections, soulful humanness, and joyful play. As we sit eating our veggie pizza, we laugh about our experiences from the weekend. We talk about how we have witnessed being vulnerable, feeling safe, being connected to our core values, playing our hearts out, and experiencing deep love without judgment. When asked what her biggest lesson of the weekend has been, she looks me in the eye and says she is leaving with the question, “Am I brave enough to be me?” I exhale. My eyes fill with tears. Her eyes fill with tears. We just sit together and listen to the question without rushing to any outcome or answer. 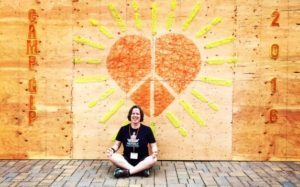 The question of being brave enough to be me has been part of my meditation since leaving camp. Am I brave enough to be me? For three days at camp, the answer was a resounding yes. I felt brave enough to hug friends and strangers, to (belly) laugh, to cry with people I met for the first time, to dance and sing, to drum publicly at a bonfire, to make my own mala (prayer beads), to nap under a tree, to take long quiet walks, to watch birds and share the joy of it with campers, to listen and bear witness to stories about longing or grief or dreams, and to share my deep passions and fears. The world has too much fear spreading and camp is a reminder that something else works – bravery. The kind of bravery that asks people to be themselves, to show up fully, and to tune into their heart and live from that place. What all of these (and the many more) moments of bravery exemplified is the ability to fully show up – as is – just the way we are. It was the experience of being able to laugh and cry in the exact same breath. We can be brave and doing it afraid in the exact same moment. And we can do it together. This is what it means to connect deeply, live soulfully, and play joyfully. Am I brave enough to be me? I take another exhale. I share with my new friend, “I needed a detox from snarkiness and cynicism.” It’s easy to be a critic; the real work is showing up and doing it afraid. Brave enough to me means fully living my values of generosity, connection, vulnerability, creativity, and spirituality. And you? What comes up when you hear the question: Am I brave enough to be me? This is dedicated to Jonathan and Stephanie Fields, the Camp GLP team and volunteers, all the campers and everyone living bravely. This entry was posted on Saturday, September 3rd, 2016 at 9:27 am	and is filed under Storytelling. You can follow any responses to this entry through the RSS 2.0 feed. Responses are currently closed, but you can trackback from your own site.